"Like" token, awarded by crantisz. "Love" token, awarded by Zuorion. "Yellow Medal" token, awarded by amonpaike. "Love" token, awarded by aschere. "Love" token, awarded by 1D_Inc. "Love" token, awarded by Okavango. "Love" token, awarded by lcs_cavalheiro. "Love" token, awarded by dpdp. "Love" token, awarded by yodus. "Like" token, awarded by fdfxd. "Love" token, awarded by kakachiex2. "Love" token, awarded by duarteframos. "Love" token, awarded by tostrong4you. "Love" token, awarded by michaelknubben. "Love" token, awarded by gandalf3. "Love" token, awarded by sterlingroth. "Love" token, awarded by GiantCowFIlms. "Love" token, awarded by allkhor. "Love" token, awarded by DaedalJS. "Love" token, awarded by Davd. "Love" token, awarded by cnd. "Love" token, awarded by KINjO. "Love" token, awarded by sdilmob. "Love" token, awarded by Blendify. "Love" token, awarded by ejnaren. "Love" token, awarded by bliblubli. 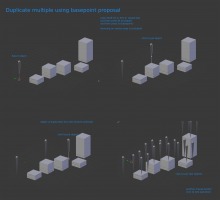 It is very difficult to grab, rotate and scale objects using basepoints. Add a a keybord shortcut which will let user select basepoints during grab, rotate and scale operations allowing precise transformations in easy way. In this case similar tasks like duplicating objects and putting in precise places could be done a lot faster. Ability to grab, rotate and scale objects precisely. Functionality especially useful for architects, interior designers, but also will be beneficial to many blender users. D1505: Repeat Operator - multiple transform. UX wise, I would expect it to ask the user to specify an element (vertex/edge/face) where the pivot point is to be placed when a transform is started, use the last one used by default, and allow to reselect one by using a shortcut displayed in the header. May I suggest in the proposed mirror operator that it default to mirror only in the XY plane. Then pressing a button if you want to specify three points for the exact plane? From working with rhino I know that you often use XY plane more often than three point placement. It's not clear to me if Basepoints are intended to be Transform Origins or Snap Targets / Elements or both. When using Manual snapping for example, there's no visual feedback for selecting basepoints. No hover, or other feedback to indicate that you're in a transform operator. The toolbar callout of Select a Base Point is not sufficient. It needs directions for how and why. How is a user to know what a base point is, or how it relates to Manual Snap Targets? The Base Point sub-modal is causing a lot of confusion. For example, if Manual snapping is enabling and you start a Rotation Operator, then the dashed line indicator is still drawn, but it doesn't do anything as it's waiting for a Base Point. As with multiple snap targets in transform (A), this is very difficult for new users to discover since it's hidden within the modal operator and is dependent on snapping configuration. The discoverability is not just a problem with these Base Points, it's a problem with most of Blender's modal operators, which is one of the issues that (I personally hope) needs to be resolved during the 2.8x project, but it's particularly evident here. We discussed this a bit in the #blenderui IRC channel (@Campbell Barton (campbellbarton), @Julian Eisel (Severin), @Paweł Łyczkowski (plyczkowski), and myself), and it was mostly agreed that this is a good feature to support, but it needs to be done more carefully and comprehensively. Blender's snap system is really quite primitive and needs a lot of improvements (such as this one), but it needs to scoped out well made to work well together with other parts of Blender, such as the 3D Cursor. At this point it's probably best to step back and scope it out more carefully, perhaps for inclusion in the 2.8x project. How do base points and the 3D Cursor interact? How can the functionality be integrated with all snapping modes and exposed to the user in a clear way? I agree that is still needing some works, regarding to UI, some things like changing the cursor when selecting is already done (removing the helper) in rotations but not uploaded in blender patch tracker. But maybe another cursor should be set to realize you must select a point/reference. I think that the feature has been designed at the beginning according what a CAD user expects to found. I would remove the term of "BasePoint" and use the proposed "Manual Pivot Point" and "Manual Snap Target". Currently they are missing the submodals to select two points for reference (Vector) for scale reference, and 3 points reference (plane) for Mirrors. Anyway, i can see that maybe the transform code will change on 2.8x ¿? Should I continue working on current code ? Is there any place to checkout the custom-manipulator-project and see it's status ? just my perspective on the feedback and questions as a user with a CADD background. separation between the 3d cursor and base points is muddy because the 3d cursor is a base point if you set it as the transform origin/pivot point. in other programs a "base point" is a transform origin and a "snap target" is what you want that transform to snap to. 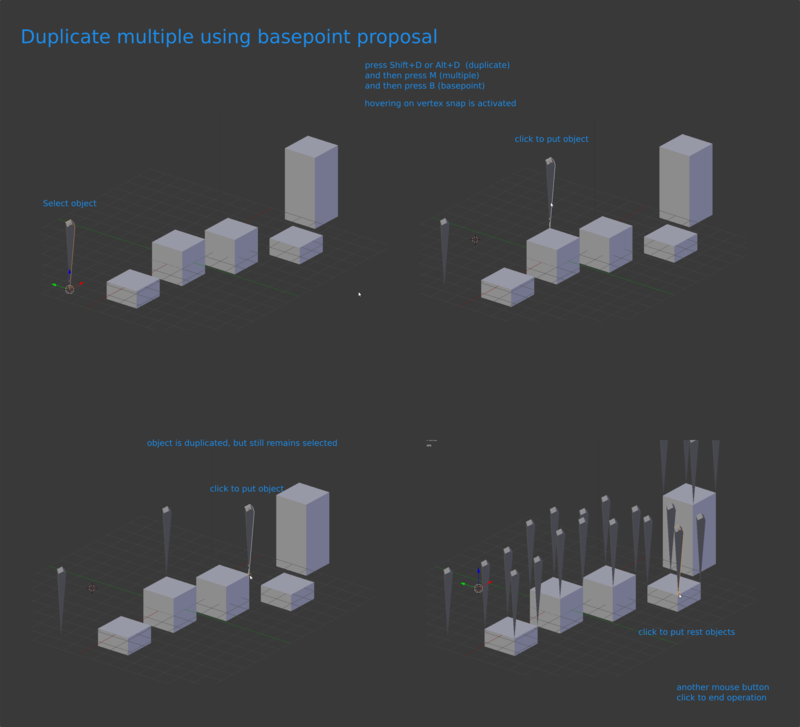 in blender a "snap target" is kind of a mix between what is, in this proposal, called "base points" and "reference" points. in the case of using the move/grab tool the snap target would be the base point but in regards to rotation/scale tools then blender's snap targets would be "reference" points.... because blender is just weird like that. blender's implementation of these things seems inconsistent to me. 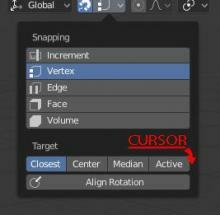 i mean everyone calls it the transform origin rather than the pivot point regardless of what blender's tooltips say and let's be honest i don't expect "snap target" to have anything to do with what i've already selected rather than what i'm aiming at snapping to so the default "closest" seems like a great choice when honestly it's a horrible choice for precise work. it took me forever to figure out that you could do all the same things as this proposal allows (though it's much more roundabout than how this proposal does it) and i don't believe i've ever seen a tutorial actually cover how to do it much less seen a tutorial where anyone ever changed that from "closest" i have seen tutorials where they say you have to basically make two moves/grabs in order to precisely snap that way though. so that wording seems likely to throw people off rather than help. i'm embarrassed to say that i've been using blender since at least 2008 and have only just figured out how to do this stuff recently. the 3d cursor already has the functionality of a base point it just isn't used as well as it could be and it also has problems for precise rotation/scaling since it is just a single point (set blender's snap target to active and go into edit mode to make a precise choice of the second point needed for precise rotation) and in the case of moving/grabbing it gets entirely replaced by the snap target option selections rather than being the "base point" there too. essentially blender's tools already have "base points." you just happen to know them as transform origins or the "pivot center for rotation/scaling" (active element/median point/individual origins/3d cursor/bounding box center) and the snap target options for the move/grab tool. in order to precisely do things like this proposal easily lets you do, you have to set yourself up so you can. again, for the move/grab tool you just have to change the snap target to "active" and enter edit mode. the center of the active element becomes your "base point"
for rotation/scaling you have to first turn the transformation origin to the 3d cursor, then snap the 3d cursor to your "base point." now you turn on your snap mode to edge or vertex (really anything other than increment but those work best for precision work) and set the snap target to active. then select what you're going to rotate/scale and make sure you select your "reference" point last so that it is the active element so that it will actually act as the "reference" point. now you can just activate a rotation or scale and it will snap to things like is easily and quickly done in this proposal. the base functionality is already integrated with snapping modes it just isn't very noticed by us users or even that clear that this kind of thing is doable. you just have to go through the process of swapping the transform origin, snapping the 3d cursor, setting the proper snap mode and target and making sure you've got the right thing selected as the active element, every time before you rotate or scale. granted you'l likely undo or have to change at least 3 of those 5 things every time you want to do this process. what do widgets have to do with this? if i read that page right that work is essentially about making the workspace more workable rather than having to rely on buttons and sliders in panels or tabs. granted that project would work great for things like spin where you've got number of values and settings to adjust but move scale and rotate already have widgets and while they're nice they're no good for quick but precise work and they won't really be much good for selecting base points, reference points, and snap targets. you can do the basics of this stuff already (in edit mode) except maybe the mirror thing but it is a much bigger hassle than this. in the last video that Jaume Bellet posted the only problem i see is that when you add these as new options for snap target modes and pivot points/transform origins why would me or anyone else bother to use the old ones instead? the only reason i can think of is if we just don't bother picking them because we use the hotkeys for this. i certainly don't enjoy having to stop and swap my pivot point every time i need to do something like this when i know i'll have to swap it back right afterwards. i know . and ctrl comma but those are usually out of my natural reach so i use the mouse instead. the only possible concern i have for this is that maybe there won't be a setting in the user preferences that allows me to have blender temporarily swap the snap mode to vertex (or user's choice) when i hit the b hotkey only to have it automatically swap back to increment once the move/rotate/scale is finished. if it does do that then i can just leave the default snap mode as incremental and i'll virtually never have to touch that setting ever again. IMHO the shorcut proposal is what you could expect. Note that CRTL+SHIFT+TAB is working during point select so you can change this setting during the operation. The settings and names on the UI were added to match what you currently find in Blender. If you set the snap target as manual, you will be must always select the reference point, so i think it's not so bad. The same for the center of transform. In case both settings are enabled, center goes first. Maybe a way for selecting the last one used will be also useful. The presentation was not as good as expected as we had linux problems... for getting output to projector, so realtime demonstration during it was not possible. Following our discussion in the diff thread, could you add the possibility to move the view to the whole process? At the moment, most user will zoom in to select snap point and will then be unable to select target because Blender blocks the view when grab/rotate/scale or duplicate starts. I know this is not due to your patch, but at the moment it can't work properly in real cases (relatively complex scene with lot of possible vertices to snap from/to). The problem of working on a patch, is maybe is difficult from some users to apply it, just to check it's functionality. Also the transform code is used in lots of places in blender, so changes on it can introduce a bug in other ares, i have only tested on 3D view. Maybe splitting the patch will be useful, although is a little difficult as the whole functionality of it is related. Also blender is changing relatively fast, so there can be changes that they break the applying of the patch as already happened, or the patch functionality. As I said, it's impossible to use it in large/complex scene at the moment because of the conflict between precision needed to select the snap element end the large view user need to move the object. Maybe you can add a key like you did with B to free the view position during grab? As an architect using Blender for archviz and precision modeling frequently I can't really stress again how important of an improvement this is for Blender. I have not tested it myself, but from the very thorough videos and step-by-step screenshots posted here I would argue that usability wise this seems very close to the workflow other CAD-like applications use, and probably very much in line with what most users seeking this functionality are most likely expecting to find. I would dare say that a "hard to find feature" or "hidden" is better than no feature at all, and has it stands it doesn't seem any harder to find than the current XYZ axis constraints. Bottom line I really hope Blender devs seriously consider this for inclusion as it currently stands, since this solves what is currently one of the most serious limitations of Blender for hard-edge or precision modeling in a very standard and non intrusive way. As mentioned by @mathieu menuet (bliblubli) the ability to manipulate view during operators would be really nice addition, not only during transforms but other operations too, though that would probably be deeper change with many potential complications and conflicts better suited for a more general revamp beyond the scope of this patch. I want this, how can I have it? Just like the widgets draw the transform axis with the XYZ labels maybe the origin center, base points, and reference points could also have the corresponding hotkeys displayed as a label as well, allowing changing them either by clicking on them directly in viewport or by pressing corresponding hotkey, improving both usability and discoverability. Forgive my insistence but I really appreciate Justa's work and think this is a very important improvement for Blender. In terms of how well this feature is presented through the UI could easily be solved by adding something inside the pivot point menu and good it is. For further information read the manual. I am somewhat a little surprised to see the resistance here the proposed enhancements. I am curious about how many of the the critics work in other CAD apps and not the workflow there? Maybe you are not just comfortable with the proposal because it works different than you personally do work? I am just genuinely curious. @claas eicke (cekuhnendev), The reason we're not really keen about adding this feature as is, is basically that we think we can increase the potential by a better integration in UI and workflow. This might involve redesigning the entire snapping toolset, but IMHO it will totally be worth it (and has to be done at some point anyway). This task has become another hard-to-follow-wall-of-text, so I suggest we try to bring discussion back to design itself, mainly based on Jonathan's comment (which is UI team feedback). @Justas Ingelevičius (ingis) maybe you could add a section to the task description that lists the currently open questions to discuss, and what general consensus is? Just so that people can get an overview of the discussion without having to read up on all comments (I for my part already lost track long ago already :S). Assigned the task to you, so you can edit the description. Good idea. I will be away for some days. Could work on that next week. The proposed widget idea is good, making it movable like an object. This should be true also for the 3D cursor. You still cannot move drag snap it in object mode. Start point, reference point, target point for scale and rotation. Start point for object snapping. snap it the way you want and not the what Blender can come up with a possible solution. Maciej Morgaś (yodus) added a subscriber: Maciej Morgaś (yodus). Blender is so incredibly close to being an industry leader. I truly believe this. Adding powerful snap and a few vital animation tools will put in the league with the most used Viz and CC software to the point that any minor improvements will be leading these industries. Excellent work keep it up. i still very much want this as well. maybe since they're messing with the 3d cursor in 2.8 they'll be willing to mess with snap targets too in order to improve them in 2.8 as well. enabling something done quick and easy but precise like this enables you to do would be a good use case for improvements to the current system. I think this was originally declined by the developers because it tampered too much with the transform code, which was said to be delicate already. Wondering if something like this could somehow integrate with the new work being done on T54661: Gizmo Design instead. A very nice tread about 2-point CAD snap! But we should also remember, that all of this should work in both object and edit modes. In 2013 I started research to discover tool, that will allow any kind of precise 3D transformation of selection, based on CAD snap system like this. Here is my proposal for temporal widged that can expand this snap system. It is based on behaviour of current ruler/protactor tool with ability to "hook" current object selection (like pose mode in armature) to bring precise CAD alignation. This tool concept is based on series of research that was made in 1D_Scripts in mesh representation. This tools are mostly 3DMatch, Sideshift, 3D Rotor/Scaler and Aligner. Links will brought you to videos that explains that concepts on practical tasks. Current CAD snap is all about desperation. Here is GIF about it. Don't know how it was missed. Here is GIF about it. Don't know how it could be missed. This is hilarious! And a bit sadly very on point. yep. that GIF says it all. i mean as blender users we've all adjusted to having to move the object into a position where snap will work so we can actually move with snap where we actually want it but if you have to move the object into position for the snap to work, then snap isn't actually working. all those other programs in the GIF are being a great example of base points being chosen btw. Okay, it seems to be not clear yet, so I will explain what you need to do. 0) You have to move object with one particular point to another particular point. With absolute minimum of manipulations. Click-click. To realize the importance of such ability you have to work in massive architectural industry for years and do such operations thousands times per day every day. And yes, we are using modeling tools for about decade, we all know about mesh snap, we know all your possible answers, and we already wrote tools that made such thing even faster than on your video, you can find it in my prevous post. selecting "Snap to vertices" and "Snap center onto target"
Ps. I think this task isn't right place to discuss this topic - it's already too long and nobody cares. I have created an idea on Right-Click Select. Please up vote it so we can gain some attention. To realize the importance of such ability you have to work in massive architectural industry for years and do such operations thousands times per day every day. And yes, we are using modeling tools for about decade, we all know about mesh snap, we know all your possible answers, and we already wrote tools that made such thing even faster than on your video, you can find it in my prevous post. Can i dump all of my tokens here? Christophe Swolfs (aschere) added a subscriber: Christophe Swolfs (aschere). Zino Guerr (Zino) rescinded a token. Zino Guerr (Zino) awarded a token. I think its very useful. There is mathematical problem. Origin in Blender is not the same thing, like pivot in maya. Blender's origin is true origin of mesh - it's base and zero. Maya's pivot - is local transformation point, that is counted from real origin that is never shown. If you are familiar with maya you may know that decorated pivot is pure mess with instances and double origin recalculations. Also, you can use addon with that functionality on your risk. That means, that 3D cursor have to be grabbed with selected objects, also any kind matching/alignation/sideshift/rotor tools reqiures at least two points. There is a lot of similar researches about object/edit mode of this kind around snaps/alignation. Kind a good point to start from, it is nice to have such prototypes. In the cad applications, this operation is a standalone tool and often has the name "move" and is separated from the simple functions of grabbing to move objects ..
Having separate tool for moving with snap, rotatig with snap and scaling with snap is wrong solution, snap problem is problem of just a several lines in Blender's snapping code. This is not the way we go. We follow relevancy priority order. Hi, nice script! Works well. I have some suggestions. When using CC Copy you select an object, select point, move a mouse, then original object disappears. After a mouse click, nothing happens. The final result is visible just after hitting "Enter". It would be more intuitive if the original object will stay visible and copy created immediately after mouseclick in a new location. With ZZ Move it would be cool if after move original object "ghost" will stay in place with the possibility to snap to it. And disappear after finishing the operation. Is it possible to assign keyboard shortcuts to those operations? Ar you planning to add RR Rotate and SS Scale options? :) Also 2.8 support? Maybe I can join with further development of plugin? here obviously my curiosity emerges, why hasn't this patch set been implemented? I followed the videos here, and I did the tests and methods used, using "b" and "c" key for point-to-point snap and rotation around a point ... and they're brilliant! the combo "g + b + ctrl-shift-tab" to change snapping mode on the fly .. it's very powerful! No, we stopped this research, because such thing need to be available in Blender by default, at least, as far as it already have any kind of 3D software for decades. Otherwise such tools will spread exponentially like any other crutches and bikes in programming. Snap system should be updated at least for that tiny bit. I contacted developers, they are busy with stable 2.8 at the moment, so snapping update is in the planning stage of the next step.